TAKE a selection of Britain's top amateur roadmen, give them a 138-mile stage of assorted, testing terrain in Lincolnshire, Nottinghamshire, Derbyshire, Yorkshire and Cheshire and you have all the ingredients for a gruelling and interesting race. Add to that 16 extra miles due to an off-course mix-up; a howling wind that clamped 40 m.p.h. force bursts to hamper the riders' progress. Abetted by liberal doses of icy rain, and you have the story of last Saturday's opening stage of the Quaker Oats 1,000-mile, eight-day stage race. From the 79 starters from Skegness in overcast conditions, 75 survived the batterings of a wind that was head-on for over 100 relatively. flat miles, followed by the savage uprisings of the Derbyshire peaks and Bronteland's pitchings and tossings, to arrive in Manchester spread over two hours. And as riders, after surmounting Snake Pass, were still casting longing glances from the summit across the valleys and moors to catch a hazy-smokey glimpse of Manchester, some 15 miles farther -on, the final stage-winning drama had been played out. First portents of a day of sensations took place in Skegness. Watched by dense crowds of holiday-makers, the riders were ready to start when a puncture by Doug Collins, Army C.U., delayed proceedings. The pace was furious right from the word "go". There was traffic congestion at Louth (24 miles), and in the confusion the whole field took the wrong turning and were off-course. Into the strong head wind,' with drenching showers, a breakaway group, including Bill Bradley (Merseyside) and Pete Ward (North-Western Counties); Bill Seggar (South-Eastern Counties); Gil Taylor (Warwickshire); Neville Crane and P. Ellison (Yorks and Eastern Counties), and P. W. Pinnington (Wales), was clear of the big bunch. After 12 miles of off-course wanderings the decision was . taken to re-route the race to link up with the original planned roads. The riders were timed and stopped, and after a brief halt the breakaway bunch was dispatched 35 sec. ahead of the main group. But the kick seemed to have gone from the breakaway group's efforts and they were soon reabsorbed. However, a second attack was soon launched, and the start of the key move of the day was made. Paddy Boyd (Army C.U. ), Pinnington, C. Mather (Manchester) and F. Norton (Yorkshire and Eastern Counties) started an assault that took a small bunch clear. At Gainsborough (71 miles) they had a two-minute lead on the main bunch that was headed by Frank Clements, of the Midland team. On through Retford (82 miles) and Worksop (90 miles) that position remained. The change came at 105 miles at Rotherham. The biggish gears had been turning for five and a half hours over flattish country. Then came the change ! And with the advent of the big hills the gap between the leaders and a second group was bridged. And thousands of Saturday afternoon shoppers at Rotherham saw one big group of leaders, including Ward, Bradley and Doug Collins, go through, leading a second bunch led by Brian Hawkridge (Army) by 11 min. Several riders were dropped from the leading group on the ascent of the prime hill at Oughtibridge. At the top Bradley showed his power with a finely judged win to take the prime and its attendant -minute time bonus. More hills in the Bronte country saw the leaders split in two. Bradley, Ward, G. Taylor, F. Norton (North Eastern), N. Taylor and R. McNeil. J. Rae, of Scotland, and J. K. God- dard (London) had a 2-minute lead over Collins and Boyd, C. Mather, D. Hutton (London), and M. Bingham (North-East Midland). R. Killey, Merseyside, at 4-17. 6. So, via Chapel-en-le-Frith and the Derbyshire Peaks to the final test of Snake Pass. After a no-quarter struggle, Gil Taylor, of Warwickshire, a lean 23-year-old, opened up a gap. Twirling a 46-in. gear, he forced on ahead to the top of the pass, where he had a 45-sec. lead, on his group. Spurred on by Bradley and Ward, the pursuers were in full cry down the pass. Slowly but surely the Birmingham man's lead dwindled and he was caught with eight miles remaining. Then came sensation. Wonderman Ward was off the back ! Non-stop battle for over eight hours had told him (sixth in the race last year . . . his honeymoon week!) that there were other days when the energy he would have spent on the last few miles of the first stage could be more usefully utilized. Goddard and Norton had fallen back earlier, and together the three were re-absorbed by the chasing bunch. Five left to fight out the finish. Bradley led out the sprint, Gil Taylor flashed past him with 200 yards to go. Off the road on to the cinders for the last stretch and 20-year-old Tour of Ireland winner Rae took the initiative, went past both Bradley and Taylor to take first honours at Belle Vue. Ward's strategy in saving himself and being dropped seven or so miles before the stage end on Saturday was quickly justified. He had eventually finished 4-23 behind stage winner Rae. But he soon set about retrieving the position the following day. Again the second stage of 131 miles from Manchester to Morecambe was action-packed from the start. Originally a reserve, Barry Jackson (Manchester) attacked immediately the race was de-neutralized, and from the effects of that move, started just as the race began, later came Ward, who sailed through the field for a big lone win, to take the stage and the yellow jersey of race leader at Morecambe. Jackson utilized local knowledge to jump away at the right moment on an effort that on the face of it looked; too early to be of lasting effect. He took with him G. Watson and A. MacPherson (Scotland), G. Taylor, McNeil and P. Pinnington. The wind was hard at the riders' backs, and 18 miles from the start a second group came up to join the leaders. In it were : S. Lawton (Yorks and E. Counties), N. Taylor (N. East), B. Crozier (London), C. Mather (Manchester), J. Nicholson (Tees-side), J Goss (Western) and " marked men'' Bradley and Ward, making a compact group of 14 away. Next splitting came on the first prime in the sweeping Craven limestone country of Yorkshire. There, on Deanbrook Fell, Bradley turned on the pressure, and none could hold this slightly built Southport man. The leaders split completely. Bradley took the prime, with Mather second and Jackson third. Ward was fourth, and on the descent this leading four regrouped. At this point they were 4 min. up on Watson, 7 min. up on a group including. Rae and soldier Collins. 84' min, up on the main bunch. Tragedy for Bradley followed. A few miles on he punctured and broke his gear cable. On the second prime Ward and Mather left Jackson struggling. Ward was beaten for the prime. Shortly afterwards Jackson was caught by a chasing group, in- eluding Bradley. Into a strong wind, Ward and Mather increased their lead. At the final prime of Whernside, with some 30 miles to go, it was Ward's turn to cross the line first. Jackson was third. A little later, at Kirkby Lonsdale, the Lancastrian pair, Ward and Mather, were 11 min. up on McPherson, Taylor, Jackson, McNeil, and Bradley-. But how that -group was working to cut that big deficit ! The sight of Morecambe Bay, nine miles before the finish on the promenade, must have been welcome indeed to Ward and Mather. Two miles from the line Mather signalled to Ward to go ahead, as he was no longer able to work, and away went Ward to round off a grand effort certain to gain him over-all lead. 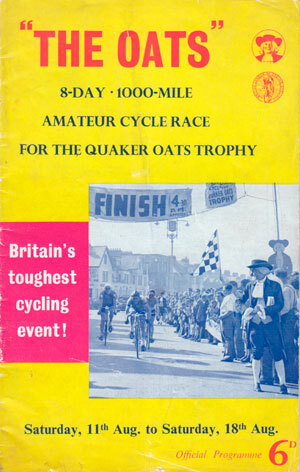 THIS year's Quaker Oats-sponsored 1,000-mile event provided eight stages of muscle-shearing, nerve-shattering agony; a test of endurance that strained every reserve of the 79 starters from Skegness, and cruelly left a trail of those who had fallen by the wayside in its sadistic wake, until only 45 were left in the end at Worthing. Label as a giant a rider who overcame all the odds to triumph in this toughest of tests. For Richard McNeil, a 24-year-old 6 ft. 1 in. Wallsend-on-Tyne marine fitter, rode faultlessly throughout; with cool, precise consistency to take and hold the lead, and with frenzied, forceful savagery when the tide of fate turned. For when the "Hamlet"-like plot that had erased his main opposition (in Mather, Bradley and Ward—and was later to set Collins well back) turned full circle and struck him down, he alone could rise above the odds and fight on till the end. Was it too hard, that marathon circuit of England and Wales that took in goat tracks and mountain passes that most competitors had to walk, and during which wind and rain combined forces against the riders ? Maybe organizer V. Humphrey did feel a prick of conscience when the weather made the deliberately difficult course he had planned back in the winter take on an almost impossible look. Indeed, one day's result sheet bore an apology to the riders from him for the difficulties of the route. But this race where hardship cut out every semblance of glamour and reduced it to the bare essentials of a struggle of the fittest for survival, produced heroes equal to its Spartan formula. N. Purdy, North East at 3-25, 6. SENSATIONS came early on the third stage of 115 miles from Morecambe to Rhyl. At Garstang (15 miles) Bill Bradley, then lying second on general classification, was dropped. An old knee injury had been aggravated by the extreme cold. But he pushed on gamely in company with Pat Pinnington, Wales, who was also troubled by knee discomfort. pace. Clements was seen to be riding strongly, and descending the mountain into Holywell with 15 miles to go, he pulled away alone to a 150-yard lead on Scotsmen Rae and MacPherson, and Ryan. Mile after mile passed and still the blond Midlander kept his 150-yard lead. Ryan proved too strong for the Scots and pulled away with three miles to go. . And the. 20-year-old Clements crossed the line a clear 36 sec. ahead of Ryan. Ward was equal 30th, at 11-32, and Rae regained the yellow jersey, while McNeil, 8th, jumped ahead of the Preston man. Bradley finished 2 1/4 hours down, and was unable to start the following day. A. MacPherson, same time, 7. A. MacPherson, at 13 min. 55 sec., 4. On the following stage of 122 miles, from Rhyl to Aberystwyth, further upheavals were witnessed early in the proceedings, Ward punctured early on, got back with a chasing group, only to fall on descending Penmachno (30 miles) and receive concussion to' finish eventually at Aberystwyth in 34th position, 12 minutes down on stage-winner Manxman Ron Killey, riding for the Merseyside team. Rae, Manchester's Mather, and, of course, Ward, all missed the vital break. And McNeil jumped into race leadership with a clear working margin of five minutes, after figuring prominently in the break that proved the key point of the whole race. Ryan, Mather, Taylor, P. Ellison (Yorks and Eastern Counties) and F. Clements were away before ancient Harlech (53 miles) and reached Bar-mouth two min. up on the main bunch. There the race stopped for half an hour. Competitors were, after resting for that prescribed time, dispatched at the exact intervals at which they had arrived. Regrouping occurred after the resumption, with, notably, T. Bristow (S. Eastern Counties), Army man Doug Collins, Killey and McNeil joining the five leaders, Collins and Ryan (who had been brought back after--a solo break) were dropped almost simultaneously on a sharp rise shortly before the finish. Bristow was the next to go with only yards left, and McNeil was content to see Killey take the stage by I sec., with Bristow third. Rae, Mather and a dismal-looking Ward all missed that most vital break, and the yellow jersey passed to McNeil, by far the most consistent rider in the race with, at that time, two second places, a fourth and an eighth. He enjoyed a clear 5-minute lead over Rae, by his efforts on the stage. Ward, seriously concussed, was unable to start the following day. J. Saunders, Midland Counties, at 2 min. 23 sec., 6. R. Killey, at 29 min. 46 sec., 4. Giants of the fifth stage of 139 miles finishing at Barry were the two men who, when racing commenced at Rhyl that morning, were lying first and last on general classification. McNeil, unlike Rae and Ward when they wore the yellow jersey, rode superbly to the formula of attack being the best means of defence. And Pinnington, of the Welsh team, whose knee trouble had cost him five hours in three days, emerged the moral winner of the stage. Pinnington started the first attack, with South-Eastern Counties-man T. Bristow, before the first prime at Elan Valley, after 28 miles of climbing, and reached the top first. At Builth Wells (43 miles) Bristow was away alone. A chasing group of Pinnington, Clements, J. Saunders (Midland), McNeil, J. Nicholson (Teesside), G. Taylor and N. Taylor (N. Eastern) emerged. Bristow was caught on a sharp rise at 63 miles, and later dropped. McNeil had been working energetically in the bunch and not content with bringing back the Essex man, he started a further offensive himself. Only Nicholson could hold his wheel and this fast-moving "tandem" raced on to the third prime, taken by the Tees-sider, 1-10 ahead of the six already named, and 11 1/2 min. ahead of the bunch which contained McNeil's three closest rivals, Rae, Mather and MacPherson. A masterful attack in defence. At 88 miles McNeil and Nicholson were caught by the Pinnington group. At 102 miles McNeil took the Hirwaun prime, and again proved himself a worthy wearer of the race-leader's jersey by going away in a long wearing effort on his own. But he was reabsorbed. A puncture at Pontypridd, with 21 miles to go, cost Pinnington two minutes. The break was in full cry for the finish. Up the steep hill from the town the Welshman rode like a man demented in pursuit of his quarry. And in 10 miles of 30 m.p.h. all-the-way endeavour, he was back ! At the finish bad luck again came Pinnington's way when he was baulked by spectators with 150 yards to go. Clements took his second stage in the race and a rightfully jubilant McNeil was third, taking an even bigger lead on general classification. Mather ran into a dog, landed on a spanner in the pocket of his shorts and lost much time. He finished last of all 11 hours down, but his downfall saw his team drop from first position in that section of the event to seventh. North-Eastern Counties took over the lead. P. Boyd, A.C.U., same time, 6. F. Clements, at 23 min. 23 sec., 4. In view of the hard conditions experieneed and consequent racing finishing in arrears of schedule, the sixth stage starting from Barry was cut by nine miles, but rain, high winds and numerous crashes had combined to knock the-already depleted field down to 46 when racing finished at Weston-super-Mare. Mather retired during the 132-mile stage. South-Eastern Counties , men, Seggar. Smith and Bristow got away with Killey, and W. Shepherd (N. Western Counties). The prime in the Mendips (Dundry Beacon, 114 miles) went to Shepherd from Killey, with Beggar and Bristow dropped. With seven miles to go, Brian Wiltcher, showing his true form for the first time in the race, left the second group (then four min. down) and set off through the pouring rain in lone pursuit of the leaders. On a sudden climb with three And a half miles to go, Shepherd was dropped. Then on the downhill run to the finish, through the driving rain, came disaster. Descending at 55 m.p.h., both Killey and Smith side-slipped on a patch of mud and went sprawling 20 or so yards. Both were severely cut and their machines were wrecked. Shepherd swept past them. Smith resumed and trailed him to the line. Killey, bleeding profusely, after his third crash of the day, continued gamely to take third Place, 26 sec. down, almost 2 min. ahead of Wiltcher. The effect of the stage was that Killey jumped over Rae on general classification to third position, with Gil Taylor still second. Smith's wounds required four stitches when treated in hospital that evening. M. Storey, Manchester, at 4 min. 47 sec., 6. F. Clements, at 19 min. 8 sec., 4. That the race was continuing to fallow a Hamlet-like plot was proved early during the penultimate stage of 120 miles from Weston-super-Mare to Lee-on-Solent. McNeil, after riding with supreme mastery and dodging the pitfalls of carelessness for six days, was overtaken by disaster on, the seventh. On the descent of Cheddar Gorge (16 miles), after Ryan had taken the prime, the tall Tynesider had a front wheel puncture. It threw him heavily on the road on his right side, ripping the shoulder from his yellow jersey and splitting his right leg open on the outside from thigh to ankle. Despite 1/4-inch deep cuts in his thigh, he was soon up again and calling for a machine from a team-mate. Riding with grim determination, he chased the distant bunch for miles until he regained its shelter. But in his dour chase he mistook a policeman's hand signal when halted by traffic lights as an invitation to proceed, and was penalized 4 min. by race officials on the spot for that misdemeanour. The signal for all-out action from the bunch came when Collins' freewheel pawl became jammed and the Army team dropped back to help him up. I From that all-out attack, a group of Seggar (who had been dropped on the Cheddar Gorge climb but who had regained contact), MacPherson, Shepherd Jim Grieves (Warwicks) and B. Jackson (Manchester) left the bunch. At Eastleigh (after passing into Hamp. shire at 100 miles), the bunch was 14 1/2 min. down on the Grieves-Seggar group, with an intermediate chasing group 3 1/2 min. in arrears. So to the finish, where Grieves had a very narrow win over Seggar, with Storey leading in the second bunch, 4 min. 47 see., and the big bunch including a battered and exhausted McNeil, Clements, Taylor, Killey and Rae, 12-40 in arrears. As McNeil's closest challengers were apparently either unable or unwilling to take advantage of his plight early on. the main change in general classification was that four-minute Penalty, which reduced the lead of a weakened McNeil to 10-40 over Taylor. Collins, and the Army team, after many delays, finished 27 minutes down, a loss that had a profound influence on the destination of final honours. Collins! That one word tells the complete story of the final day. For the 19-year-old Isleworth rider scored A brilliant double to end his first stage race as the last-day hero. And how bitterly must he have regretted that 27-min, deficit on the Previous day's winner, when. with bonuses, his last day's "bag" saw him within 22 minutes of McNeil. The day's racing was split into two parts. In the morning Collins scored a brilliant 15-sec. time trial win over John Ryan, and in the second half, a massed-start stage, he again triumphed after a brilliantly-executed lone break. Collins (using 84 and 103 gears!) and Ryan were the dominant names in the time trial, and on the final massed start stage of 46 miles from Midhurst to Worthing they again made the news. Ryan knew that to secure the King of the Mountains title he must take the final prime on Bury Hill, and none of his closest challengers must be in the first six across. At Petworth (seven miles) he had a 55 sec. advantage on the bunch. He held this to the prime, where, after dismounting and putting more air into a flabby front tyre, he continued. His effort for the hill climb title was in vain, however, for J. Nicholson, Tees-side, crossed the line fifth to take two points and the title by that slender margin. Meanwhile, Ryan had not pursued his lead — and was absorbed. With 20 miles to go Collins jumped away alone. Then tragedy again visited McNeil in the form of another fall. Near Steyning (33 miles) the race leader fell again while in the big bunch, but was luckily up and back with the group quickly. The scintillating Collins drew ahead, reaching the finish 4 min, ahead of Wiltcher, who led in Rae and Crane, and 6 min. ahead of the bunch, which contained a smiling and happy McNeil.